The Pizzo Preserve protects steep forested slopes above the flood plain of the North Fork Salt Creek, just north of Lake Monroe. The preserve borders bottomland owned by the Army Corps of Engineers as part of Lake Monroe, uplands owned by the Department of Natural Resources, as well as private land. A trail begins on Gross Road just east of Friendship Road and goes up a steep hill to a split. The left branch continues uphill to a field owned by the DNR, while the right branch dead-ends at the west property border. Please respect the neighbors to the west and do not trespass. Parking is limited to pulling off along Friendship Road. 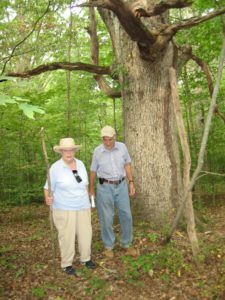 This 26-acre preserve was a gift of Anthony and Patricia Pizzo in 2007, who had owned it since the mid 1960’s. Before the Pizzos purchased it, the property had been part of a larger farm, most of which became part of the Lake Monroe property.